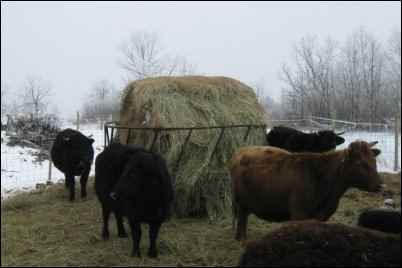 The trouble with keeping cows (aside from the regular, mischievous behavior of Bos Taurus such as crashing through fences, or getting into, and making a significant dent in, your winter’s supply of outdoor furnace screening-pellets) is that of having to keep a bull. This troublesome fact of nature becomes apparent if you want to milk your one family cow or breed your two-hundred beef girls, a bull must be gotten from somewhere. Begged, borrowed or (to finish the expression) stolen, he’s a necessary evil. If you have only a few girls, arrangements can usually be made to pander a meeting between the sexes. The girls in this case, being so few, usually go over to the bull’s digs and stay in his Paddock of Iniquity for about a month and a half, or until you can be fairly certain that he has left no opportunity wasted to do what he does best. The presumably-jaded heifers are brought home to get about the business of growing calves and in roughly ten months time produce either: your beef beginnings, or your supply of milk. Just as an aside, I’ve always found it interesting how many people don’t realize that a cow must have a calf before she can give milk. Don’t they teach high school Biology anymore? We knew we’d have to acquire a bull when we first bought our Irish Dexters. Two cows with calves at their side (a heifer and bull calf, but no matter how precocious he might turn out to be we needed a bull that was up to the job now) and three heifers made up all of our vast herd and our vast experience. At least we could console ourselves with the fact that given Dexters are the world’s smallest naturally-occurring breed of cattle, the bull couldn’t be as intimidating as his larger, Continental brethren. A bull is a management problem. Unlike his (usually) more docile female counterparts, you can never trust a bull. There are many stories of the benign bull who was “always so good-natured” that the farmer would let his grandchildren play beneath his hooves. I can only surmise that these fabled childrens’ mothers were never around when this happened, or that if they were, said Grandfather got an earful in a hurry. I would have to say, though, that for every fuzzy-warm bull story I’ve heard (and I suspect they’re just that, bull stories) there are ten or so vicious stories about rogue bulls. I can’t tell you how many I’ve heard about close-calls with the herd sire. Dairy bulls are universally known for turning bad-tempered, like a switch being flicked, at around the age of two. Their cold, speculative glances following you as you do your work. Biding their time, they watch and wait for the unfortunate (for you) occasion of when you aren’t watching. Beef bulls tend to be a bit more easy-going (a lucky thing when an animal weighs two tons and can run faster than you), some retaining their indifferent or, at best, benevolent attitudes, their whole working lives. In general, if there is to be a negative shift in attitudes, it begins gradually around the age of two or three and gets progressively worse. The moral of the story is Never Trust an Intact Male Animal, and you should be okay (it can be perhaps be argued that this maxim holds true across all mammalian species, but it’s irrefutable in the barnyard). New to farming (and cattle), we planned everything out beforehand. We’re nothing, if not thorough. We fenced off roughly 20 acres of land for pasture (an epic worthy of its own tale) and turned one corner of our odd L-shaped fields into the “Bull Pen”. We ran five strands of barbed wire, and then, because we thought we might use the area for sheep later, put page-wire over the whole thing for good measure. We used rods and rods of the stuff (rods being the quaint, almost biblical-sounding term for a fencing unit measuring 16.5 feet of length) making what we felt to be, an inescapable prison for the bull we didn’t even own yet. We didn’t start out with the idea of buying a registered bull as we planned on primarily marketing the Dexters as beef. That $200 piece of paper with the fancy writing and seal on it wouldn’t add flavor, so we thought it unnecessary for our operation. However, the downside of our cute little cows is that you can really only use a Dexter bull in good conscience for a sire, to avoid imperiling the mother when she calves, and Dexter blood in this neck of the woods was as scarce as the proverbial hen’s teeth. Our cattle were mostly purebred but unpapered (which roughly meant it was anybody’s guess if they were what we thought they were), but even so, the pool to choose a sire from was very small. Everyone who owned Dexters in the province had bought or sold from everybody else, so finding a bull that wasn’t a father-uncle or a son-nephew was tough. Our herd comprised of only two of the accepted three colors (we had black and dun), and so when we finally found our red bull, we knew we had to have him. Despite the fact that my husband is of Mennonite background and I of Spanish, we tried very hard to give herd names that reflected the cows’ Irish ancestry, and so Fergus became the red bull’s name. My son wanted to name him after a popular energy drink, but remembering the rest of the jingle I shuddered, there was no way I wanted this bull to give me wings! He was 15 months old when we brought him home. As he leapt from the trailer into his new paddock, shaking his curving horns and bellowing, I said a mental prayer that he wouldn’t go through the fence, which is precisely what he proceeded to do. He ran non-stop and when reaching the border-fence with the cows’ paddock (our first planning error, giving him this flimsy barrier directly between him and much procreation) he gathered his large frame and gave a spectacular jump, clearing the whole affair. If I hadn’t seen it, I never would of believed it, although I’ve since read about a young Norwegian girl who’s parents wouldn’t buy her a horse so she trained a Hereford cow to jump. Mouths agape we watched him lunging around, sniffing and pushing the cows, at a loss for words but even more importantly, ideas. How could we lure him back? He seemed very excited to find himself in the midst of females and the cows (mostly virgin heifers) trotted around excitedly, casting him come-hither looks over their broad rumps. Grabbing a pail of grain (because if there’s anything farming had taught me up to this point it was that almost nothing will hold an animal’s attention over grain, especially an animal that is primarily grassfed) and steeling my nerves I entered the cows’ paddock with the unknown bull, my husband beside me. Shaking the pail brought all of the bovine running towards me, Fergus included. It was obvious he had learned what The Pail (I’m sure the animals attach enough importance to it to merit capitalization) was at his old farm as he used his greater bulk and longer horns to shove aside the girls he had been trying to impress just a moment ago. While I tried not to weep with fear he stuck his broad head into the bucket and almost pulled it from my grasp as he began to noisily crunch the grain. My husband ran ahead to man the gate and I slowly backed up with the whole herd following closely. The cows looking hopefully at me in case I sprouted extra arms and buckets, and Fergus, his head buried deep in the pail, unaware that we were approaching to the gate. The Gods of Farming (or of Dumb Luck) had been smiling on me when I’d hurriedly scooped up that barley, just as we entered the Bull Pen and my husband closed the gate behind us, Fergus stopped crunching. With a surprised snort in my face (blowing chaff and best-not-to-think-about-it wetness onto my right eye and cheek) he jerked his head from the bucket and looked around bewildered. At this point, not wishing to remain and see if he bore me ill will as the depriver of female company, I scooted behind him and clambered over the gate like a monkey with it’s tail on fire. My husband smiled appreciatively and complimented my spryness while I panted, annoyed for no real reason except that I felt it shouldn’t have been me having to do the acrobatics. The cows began to jostle us trying to get a closer look at the new man through the gate, and we watched Fergus turn his red bulk to face us. He looked us up and down (and found us wanting, I think) and after licking through the gate ineffectually at his many wives, turned to explore his new surroundings. 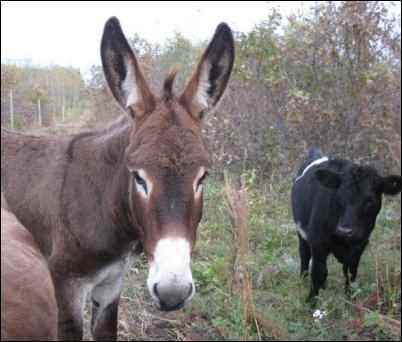 No animal should ever be kept by itself, so we’d planned on putting a new donkey we had bought, by the name of Clara, in with him. As she was proving to be a bit of a handful, we thought they’d get along famously. Not currently up to the task of trying to get her in the Bull Pen without Fergus getting out (Fergus’ potential escape was only a minor difficulty as we reckoned it, Clara was the real problem), we broke for lunch. After a quick and unsatisfying sandwich (unsatisfying because any pleasure in the meal was soured by the fact that we could think of no easy way to get Clara in without Fergus getting out, as he’d most certainly come to the gate when we were trying to open it) and an all too brief time sitting we pulled on our boots and went back out. I think I knew what we’d find before we arrived, because strangely I wasn’t surprised in the least to see Fergus back amongst the cows. He must have cleared the fence again as nowhere did we see any telltale sagging. This bull must have been part thoroughbred, we cursed, as we backtracked to the shop for electric fencing materials. While Fergus enjoyed his new wives, my husband and I spent the rest of the day (during which it began to sleet, of course) stringing up a top wire of electric fencing. The misery was compounded when we realized, after hammering about 20 insulators on, that the wire would end up touching the page-wire in places and we had to remove all the insulators, hammer on spacers, and then reattach the whole works. We finished with the early setting sun, and decided that any harm done by having Fergus in with the cows a bit early couldn’t really be compounded by letting him spend the night with them, and so we trudged off to hot showers and early sleep. The next morning after breakfast we managed the whole affair much easier than we’d imagined. By first luring Fergus in, and then strategically placing myself along a far end of the Bull Pen, I kept Fergus occupied with a seemingly non-stop stream of crushed barley, while on the other end my husband used the same trick to lure Clara the donkey in. I could hear my husband cursing roundly as he fought to allow only Clara in and exclude the cows. Then we waited and watched. Before long Fergus had cleaned up all the last bits of grain and ambled sedately to the gate separating him from his girls. Finding the gate closed, he went to the dividing fence and stretched his nose out to investigate the new top wire. We heard a satisfying snap and he jerked his head back in surprise. He narrowed his eyes and stretched his head forward again, and again was shocked. He exhaled noisily and we could see the wheels turning thickly in his dim mind. He seemed to shrug as if to say, “Right, you’ve got me for now…” and went off to explore his new home. In the end, Fergus found his way over the fence many times, and as far as I know the cows always welcomed him with whatever the bovine equivalent of “open arms” would be. The electric fence was only a psychological barrier (and the page-wire/barbed combo not enough of a physical one). If an animal wants to get to the other side bad enough (and Fergus’ libido drove him onwards) he’ll steel himself for the quick jolt and continue on over. Once they learn that fences are mere suggestions that need not be followed it’s hopeless (short of building a bovine Alcatraz). We had a terrible calving season in which it was anybody’s guess who would calve when, and by January we decided Fergus had to go.